Do you have a living room that is so big it feels impersonal? Or maybe you have a bathroom that is so small your knees touch the vanity when you’re sittin’ on the loo. Light colours help small spaces feel more alive, bright and airy. Light colours visually ‘open up’ spaces that might otherwise feel cramped or a wee bit too cozy by helping to reflect artificial and natural light. Why? Because light colours have higher LRV’s, which means they reflect more light than dark colours. Benjamin Moore White Dove in this ensuite bathroom enhances the big, bright look of this space as it’s low contrast with a high LRV. Cool colours are receding colours and help a space look larger by visually pushing your walls farther away. Soooo, when you combine LIGHT and COOL, you are getting the best of both worlds as BOTH of these things can help a small room feel bigger. But (and it’s Kardashian sized), the more genuine or saturated a colour is (colourful) the less it will recede. Adding a bit of gray and dulling it a bit will get it back to where you want it – receding. Generally speaking (oh there are ALWAYS exceptions), dark colours make a room look smaller. Why? Because dark colours advance, making the walls seem closer than they actually are. In this dining room below, there was SO much natural light flooding in. Adding a medium toned feature wall (2 of them actually) helped to make the space feel more intimate, without closing it in. (See more here). HOWEVER, sometimes it’s all in the eye of the viewer. Dark colours don’t always make a room look smaller as they are also known to ‘blur corners’, so it’s hard to really see where the room starts and ends. This can make a room feel deeper and larger. The smaller part comes in to play as some people just FEEL weighed down and closed in by darker colours, without realizing that dark colours can enhance a room if chosen well. Dark colours also have low LRV’s, which means wont’ reflect AS MUCH natural light in comparison to a lighter colour (colours that reflect a lot of light can make rooms look bigger and brighter). Warm colours are advancing colours and just like dark colours, they will make walls seem closer than they actually are – making your room feel cosier and smaller. Soooo, when you combine DARK and WARM, you are giving your room a double-whammy of cosiness! The above room was big and bright. Painting the end wall a GLORIOUS rust shade, created intimacy and added visual warmth. You vs. Your Room – the battle rages on!! Forget about the colour that you think you want to paint your room. Clear your mind, pour a glass (or 3), step back a moment and look at your room and ask yourself these questions (and it’s okay to talk out loud – I talk to myself all the time). 1. Do I want the room to feel larger and brighter? 2. Do I want the room to feel cozy and comfy? Figure out the what your room needs and THEN see how it coincides with your personal tastes. Do your tastes clash with the needs of your room? Then check out these creative combos! Whereas dark and warm can make a room feel cozier, dark and cool can be an interesting blend as the dark makes it feel more intimate, but the cool tone can help to push things out a bit. However, keep in mind that the dark will override the cool to a degree (pun intended). And, many people think that cool colours might make their space feel cold and uninviting, which is not entirely untrue in the lighter versions. However, once a cool colour gets rich enough (ie: medium toned and darker) it gains warmth through the depth of the colour. Although Hale Navy, shown in the dining room above, is a dark AND cold colour – it looks pretty darned inviting to me AND full of personality! 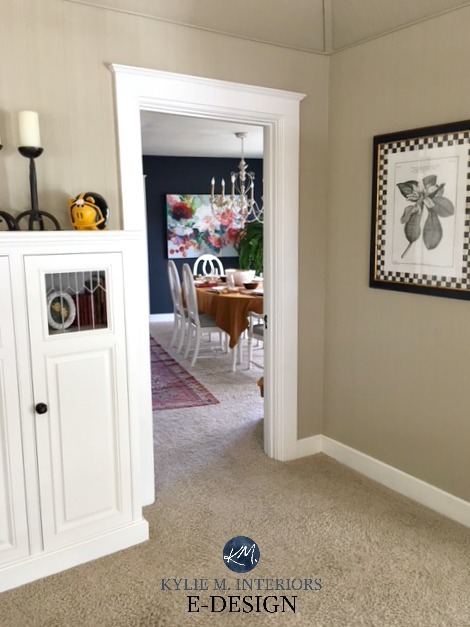 Sherwin Williams Aesthetic White is a soft, slightly warm greige that is just the right depth for a slightly warm and bright look with a greige base. Whereas light and cool can make a space feel bigger, light and warm can work if you want it to feel bright and big, but still warm and inviting! Sherwin Williams Creamy is another light, bright and warm paint colours (that isn’t obnoxiously yellow). Just keep in mind that light, warm colours can sometimes turn a bit dingy in a room that is dark (not enough natural or artificial light). Not sure which colour is best for you and your room? Kylie M Interiors Affordable Interior Decorating, Interior Design Ideas and E-Decorating / Online Color Consulting in Nanaimo B.C. I enjoyed the painting tips! Do you know the rust color in the picture above? Its gorgeous. Hi Brenda, thanks for the note! That is Benjamin Moore Tawny Rose in a south facing room – it’s a beauty! Hi, we went for dar shesham furniture , sofa is grey and we cant decide on colour for wall. Room is not small. A medium size. Would like a bold colour but afraid to go too dark. Please help. Hi Kylie, Thank you for sharing all the helpful tips on your site. I have learned a lot. I have a question about tall ceilings for you… I have rather small but tall (about 11’x12′ with 14′ ceilings) with a north facing large window that we use as an office . We currently have the same greenish khaki color on all walls with off white trim and SW gauntlet grey French doors on the south wall leading into the living room . My issue is it feels too tall and just not safe (psychologically speaking- if that makes sense). I want to feel more calm, cozy, and grounded when I am working in there. So, I am thinking about a medium grey blue/green like SW “silvermist” for the walls and considering a darker color like “attitude gray” on the ceiling to bring it down and feel a little more cozy. Would you recommend something like this to accomplish a more cozy feeling? and do you think this would work? Would off white ceilings make it feel even higher? Any tips are welcome. Thanks again for all your good insight! Hi Jill, that is a great way to improve the coziness of the room. Dark colours on ceilings are a really cool way to add personality too. Now the funny thing is, they can make a ceiling seem higher (strangely enough) but at the same time it feels COZIER. And be sure to add texture to the room and a nice triangle of light, as lighting is SO important, with nice soft, warm bulbs!